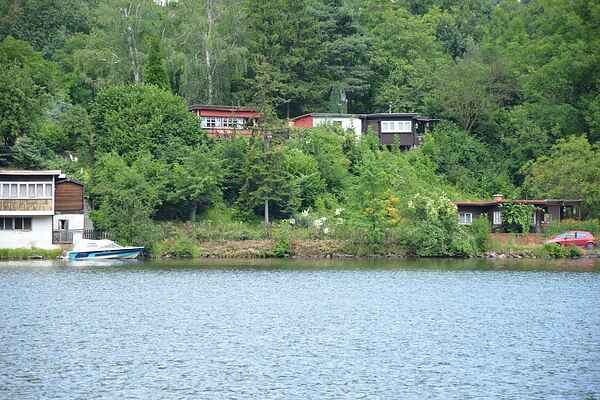 This small and cozy holiday home Na Labi (by the Elbe) is situated on the shore of the river Elbe in the municipality Brná, approximately 5 km south of Ústí nad Labem. From the weekend home, you have a beautiful view of the valley of the Labe river. The weekend home lies at 70 m distance from the river and about 15 m above the river. A small garden with garden furniture and a barbecue is also part of your house. Very suitable for couples. The beautiful canyon named Porta Bohemica (the gate to Bohemia) originated in the part of the river where your house is located. Only 300 m away lies the thermal bath Brná, and at 2 km distance the medieval fortress Střekov. With a fishing permit you can go fishing in the river. There are many carps and pikes, and even catfish aren't exceptional here. You can easily take a trip to Prague (within an hour's drive) or to Dresden (45-minute car drive). The German border is only 14 km away. You can park your car about 30 m from the home, the terrain is reached via a staircase with 16 steps. Additional information: ca. 50 m from the holiday home runs a railway track.